The 40-acre mixed-use redevelopment at the corner of U.S. Highway 30 and Interstate 65 will support local and regional tourism and economic development through unique-to-the-region offerings, the company says in a statement. The Farm at Crossroad Commons would replace White Lodging’s former Radisson Hotel and Star Plaza Theatre, as well as its still-standing Twin Towers office complex, NWI.com reports. The Farm at Crossroad Commons’ centerpiece will be a working education-based farm and greenhouse, a visitor’s center, and indoor-outdoor meeting and event center with more than 104,500 sq. ft. of flexible space. Supporting these centerpiece elements will be four hotels, a microbrewery, distillery, two restaurants, an art gallery and a 100,000 square foot office building, among other features. More than 1,300 parking spaces will be provided underneath the site. “This project will serve as a long-standing anchor for economic development and a true transformational destination for visitors to the Region – just as the Radisson and Star Plaza Theatre did for so many years,” said White Lodging chairman Bruce White. The investment is expected to create more 600 construction jobs during the three-year project. Over 10 years, the development will create nearly $100 million in new local, regional and state tax revenues. 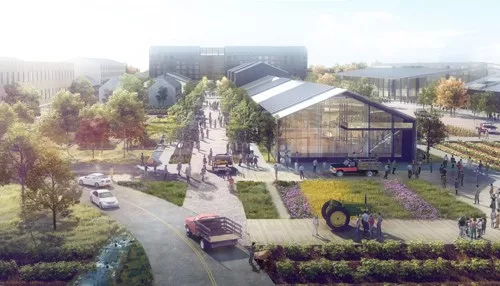 The farm and year-round greenhouse will support the development’s farm-to-table restaurants and offer hands-on agricultural-focused educational opportunities for visitors and the community. It will also be a destination for farmer’s markets and other local sustainable and health/wellness activities. The concept features four hotels with 520 guestrooms. One hotel is targeted to be a full-service premium-branded hotel with two other select-service hotels, and a bed and breakfast-style independent hotel. More than 100,000 sq. ft. of Class A office space would be marketable to existing local companies and those looking to relocate to Northwest Indiana from Illinois and across the nation. 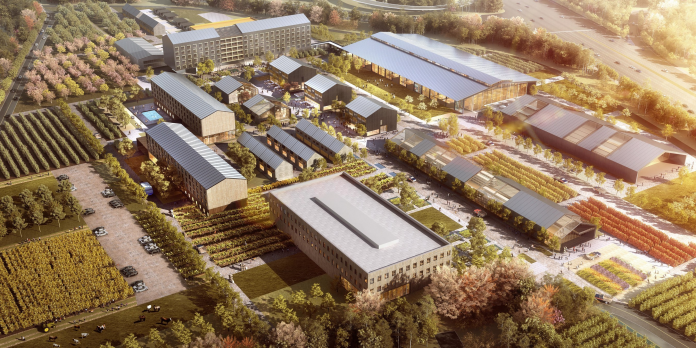 Two new farm-to-table restaurants – supported by the on-site greenhouse and farm, as well as other local farmers – would offer unique regional gourmet cuisine. A microbrewery and distillery will offer interactive tours and educational opportunities on top of locally-produced and selectively sourced beer, gin, rye, vodka and more. Supported by the Dean and Barbara White Family Foundation, a dedicated artist studio/gallery would allow residencies for artists in any discipline. The development would offer permanent residences through 18 townhouse units and 32 condominiums. The concept also features a 30,000 sq. ft. indoor arena for horseback riding and other agricultural-based educational activities and entertainment. “The concept – a breakthrough for the region that’s both bold and beautiful – is a once-in-a-generation opportunity that pays homage to my father’s legacy, and the White Family’s continued investment in Northwest Indiana,” White said. Furthering the economic development directly from this project, White Lodging will work with local and state representatives to recruit new companies to relocate to Northwest Indiana and occupy the 100,000 sq. ft. of office space. Who are the developers that are on these various projects, and how do you contact them?